Bumper over rider rubbers. Supplied in 4 pieces. Rear blade bumper in chrome. Front blade bumper in chrome. 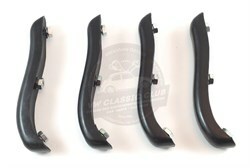 Front US specification blade bumper with overriders. Rear US specification blade bumper with overriders. Rear bumper iron. Supplied in pairs. 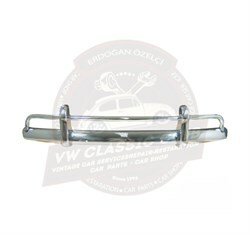 Front bumper iron. Supplied in pairs. Seal for bumper iron to body. Short type. Supplied individually. Bumper overrider support tube seal.